Our quality garden ornaments are first sculpted from an unassuming ball of clay. Artist Phil Bigelow creates each of his stone animals by casting them in pigmented concrete and giving them hand-painted glass eyes. This results in animal stone sculptures that are as durable as they are adorable, each an intricate piece of art. Is being a concrete frog what makes Frodo so chill and easy-going? Learn more about Frodo. Each of our cute creatures is signed by the artist and makes the perfect eco friendly gardening gift. Basil’s finely detailed fur appears soft enough to pet. Her squishy looking face and big eyes make her so easy to love. Learn more about Basil. After years of being an entrepreneur, Phil Bigelow wanted to create a company that was more personal, one that expressed his experience, passion and sense of humor. 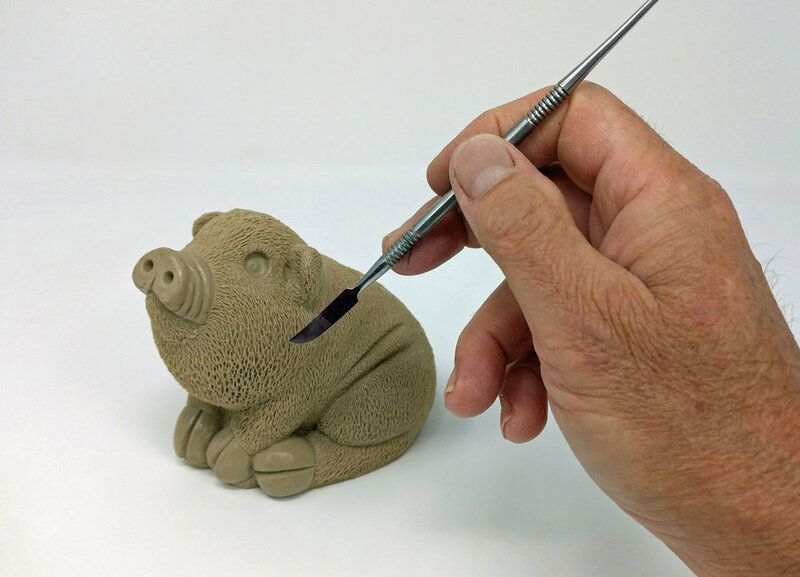 In every step of the process from the sculpting of the creatures to designing the logo and gift box, he and his partner Kellie wanted to impart a sense of joy and fun, while offering a sculpture that provides a little bit of happiness to your home. Learn more about Bigelow Studios.